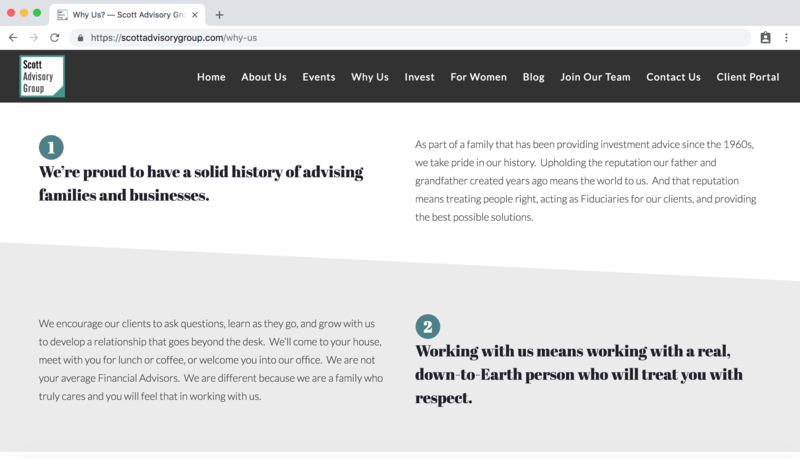 Just because you’re a financial advisor doesn’t mean your website should be lacking in the design department. Although advisors may not be known to have the most extravagant sites, it’s crucial for businesses in any industry to get their website in tip-top shape. Today, 90% of potential clients haven’t made up their mind about a business before starting their online search. 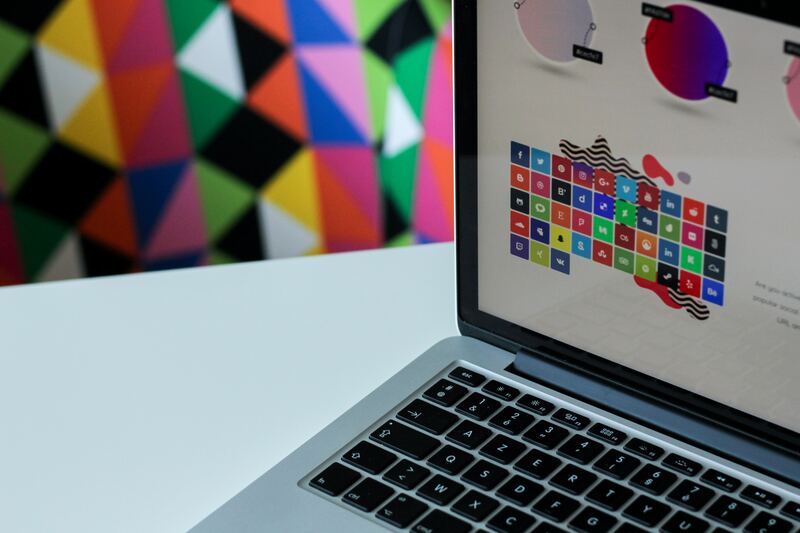 This makes it crucial that your website gives a great first impression of your brand and service, starting with the look and feel of your site. When you’re just starting to build your own advisor site, the options for design elements can be super overwhelming. As a financial advisor, there’s a good chance you haven’t gotten into the nitty gritty details of different font families or color combinations. However, having a good design starts with recognizing simple design elements that will help get your message across. With the below simple five tips, you’ll be way ahead of the game! There seems to be endless options for fonts that you can include on any website, from simple fonts to curvy scripts. When selecting a typeface or font for headings and text, use easy-to-read fonts for simple and effective graphic design. Choosing a font is a lot like getting dressed in the morning. Think about the impression you’re trying to make. Different situations call for different apparel. Make sure your choice is stylish, yet appropriate, professional and simple. In our industry, we typically see advisors choose a classic sans-serif or serif font to portray a sense of professionalism. Avoid wimpy variations. Make sure it’s obvious that the two types are different! The two fonts should still coexist comfortably enough that it doesn’t distract from the information. The two fonts you choose should still be professional, clean, and work together to deliver your message. 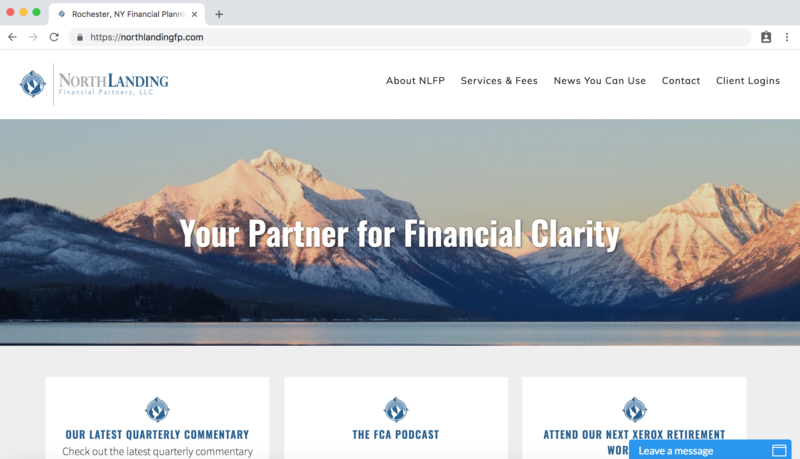 Twenty Over Ten client Northlanding Financial Partners uses simple, clean fonts that complement each other on its homepage. Font choices often set the tone for the whole design and can largely influence a potential client’s first impression. Bad typographic choices can easily distract your reader, so make sure to try out a few combinations! If you find yourself getting stuck, ask yourself if the fonts you have chosen reflect the purpose of your company and design. Not all words and pictures will be of equal importance. Changing the size of objects, elements, and text can easily emphasize their importance. The more attention you want to be drawn to something, the bolder and bigger you should make it! This goes for titles, pictures, calls-to-action, or really any element on your site that you’d want to emphasize. You should be designing each page of your site with visual hierarchy and website architecture in mind. Visual hierarchy is the arrangement, size, color, and contrast of visual elements. It determines their relative importance and the order in which they are seen by the human eye. This will prioritize and organize the information on your website so that it’s easy to navigate. Scott Advisory Group, a Twenty Over Ten client, steers the eye and denotes points of importance by scaling them. Take this blog post you’re reading as an example. The bolder and bigger headings help categorize the text into different sections, which helps steer the reader’s eye. Pick out the most important aspects of your site or text and make them stand out. Apply color or scale to a graphic to see how it changes the hierarchy of elements and what grabs attention first. When getting into the HTML and structure of your website design, the text you choose to be a heading can greatly affect your SEO. Don’t be scared of white space! Especially on your homepage, your text should be very minimalistic so that the message gets across clearly. No one wants to spend time on a website that looks and feels like a textbook. It’s important to break up and space out your text so that your message remains easy to read and provides visual interest. Create a fluid design by bordering words and images with white space to let elements breathe and not feel cluttered. Your composition should be evenly spaced, ensuring no overcrowding of shapes, images or text. Always ensure your message remains easy to read. Your clients shouldn’t have to work too hard to find the information they seek! We can’t emphasize just how important it is to include photos on your advisor site. Even more importantly, it’s crucial that you choose the right photos. Rather than just throwing any stock photo on your advisor site, choose a photo that reflects what your company stands for. There are plenty of professional, free stock photo websites that you can customize your site with. While there is a time and place for stock photos on your site, we always recommend diving a bit deeper with your photos to humanize your brand if you can. Try avoiding stock-photos of people. Rather, include photos of your team to add personality and genuinity to your advisor site. Putting a face to your brand name will create a more personal first impression online. If your company hasn’t taken headshots or pictures yet, you can also do that yourself without too much experience! 5. Make Sure it’s Mobile-Friendly! It’s safe to say that everyone is on mobile nowadays. A whopping 80% of internet users are mobile users, which means if a potential client is online, they’re more than likely searching on their phones. While searching for your site is the same process on both mobile and desktop, your site will look different across various devices. When choosing a website provider to work with, be sure you ask about responsiveness! 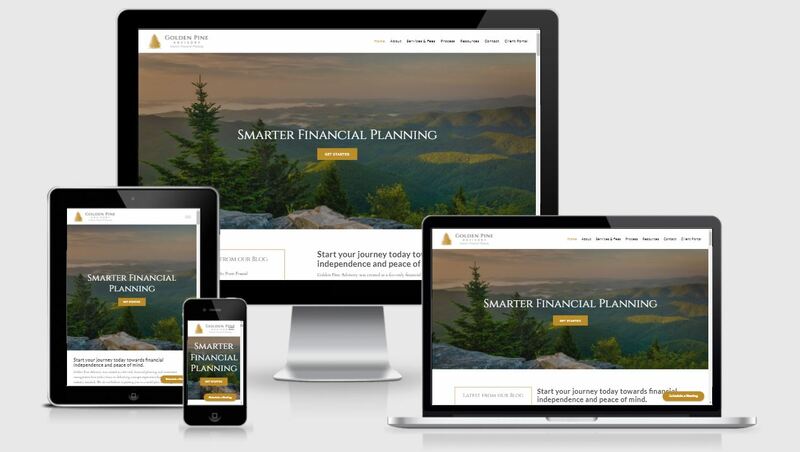 All Twenty Over Ten websites, like Golden Pine Advisory, are designed with a mobile-first approach.